The last UK tour of Priscilla Queen of the Desert ended in 2016, and there is now a new one due to kick off next September. The Musical is based on the Oscar® award-winning film starring Terence Stamp and Guy Pearce. Paul Kerryson will direct the show, with producer Mark Goucher teaming up with Jason Donovan to produce the tour: marking Donovan's first time as a producer. Donovan performed in the original cast of the West End production and in two subsequent UK tours. Gavin Kalin and Matthew Gale are also producing the tour. Joe McFadden has been cast in the lead as Tick/Mitzi with Miles Western as Bernadette and Nick Hayes as Adam/Felicia. They are joined by Daniel Fletcher (Bob), Miranda Wilford (Marion), Kevin Yates (Miss Understanding), Jacqui Sanchez (Cynthia). The Divas will be played by Nikki Bentley,Claudia Kariuki, Rosie Glossop and the cast is completed by Jak Allen-Anderson, Natalie Chua, Emma Crossley, Jordan Cunningham, Martin Harding, Justin-Lee Jones, Nell Martin and Edwin Ray. Tom Jackson-Greaves choreographs, Phil R Daniels designs with Charles Cusick Smith, Ben Cracknell designs the lighting and Ben Harrison is sound designer. The musical is based on the hit film about three friends who drive an old bus to Alice Springs to put on a show. 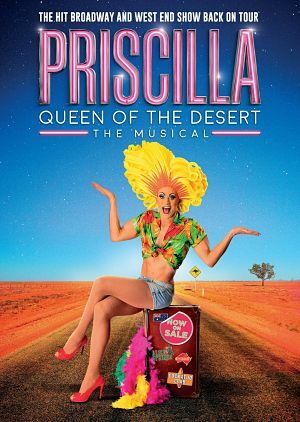 telling the story of friends of Tick, ,Bernadette and Adam: two gay men and a transexual woman - who are a very glam performing trio who live in Sydney but want to take their show to the middle of the Australian outback in search for love and friendship on a battered old bus (Priscilla). But they end up finding more than they could ever have dreamed of. The show has some fabulously outrageous costumes plus loads of dance-floor classics including What's Love Got To Do With It, I Love The Nightlife, I Will Survive, Pop Muzik, Girls Just Wanna Have Fun, Hot Stuff, MacArthur Park, Boogie Wonderland and Finally. Because to the adult content of this show, parental guidance is recommended for children 15 years and under. Below are the dates we have so far with more venues to follow.